Monocular used to View things up close. Not a hunter's tool, but a simple antique, to be used as one sees fit. 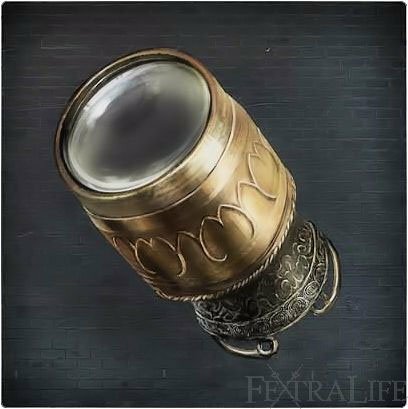 Monocular is a Tool Item in Bloodborne. Use this item to see far away. Use this item again to stop using it. From Cathedral Ward lamp, go down and left and pick the right path on the area with two bell enemies. Ahead lies the first Reaper, the Monocular is on a body next to the broken carriage behind two Brick Trolls going down the stairs to the left of the Giant. You can aim your weapon and items with this. You can move slowly while using this item. Using this item puts you into a "locked on" state, allowing for dashes. This item is great to use for Simon's Bowblade in it's transformed mode. It also works well with the Church Cannon for manual aiming. The character does not keep holding the Monocular, unlike other similar items from previous Souls games, but makes it stay on the eye like a regular monocle. question - how do you zoom with it? So, you cannot zoom in with the monocular once you&apos;ve activated it, as in previous soulsborne games? Good for shooting explosive urns and such.